St. Patrick's Day was supposed to be a night where I made a quasi-Irish themed dinner that we've been planning for a while. Instead, after a brief visit to the doctor in the morning, it turned into me being in incredible pain and spending most of the day wandering around the apartment, unable to sit or lie down. Finally I ended the evening with a heating pad on my back eating Chinese take out with Jen on the couch. It was the saddest fake holiday since Jen and I spent a Valentine's Day in New York city eating take out from the "Cooganelli's" Italian menu from our local Irish pub and watching a special on Russian mail order brides. Tonight started off with the use of the leftover colcannon and batter from the cheddar potato batter I used for the asparagus potato tart from last weekend's St. Patrick's Day festivities. I combined the two (in some proportion) and added some panko along with a little extra shredded Irish cheddar. Then I formed them into little balls, covered them in panko, pan-fried them, and finished them in the oven. 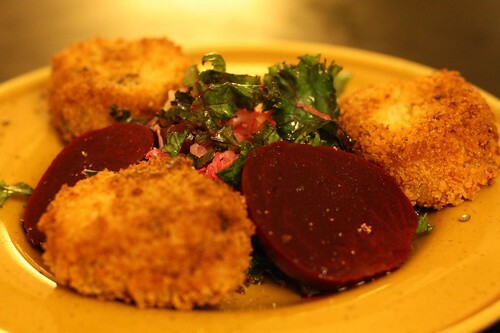 I served them over some red kale which I tossed with olive oil, sauerkraut, and pickled beets. 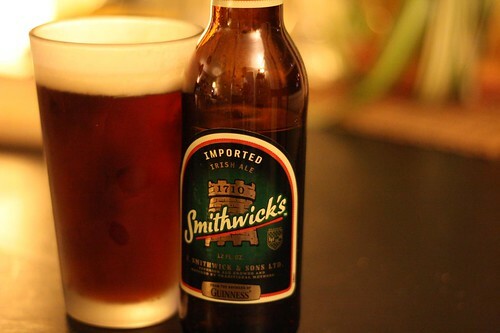 With dinner I had a Smithwick's. I'd purchased this as to remain authentic but as with the Harp and the Guinness I think I just don't like Irish beer. At least I don't like the Irish beer that makes its way to our shores. I'm sure there's plenty of good stuff over there in Ireland but all three of these certainly leave me wanting more. Well, more of something else. 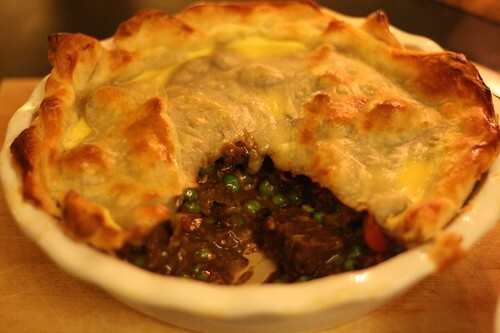 For the main course I made this pot pie with beef, Guinness, and cheddar based on Jamie Oliver's recipe. Jen has been wanting to make/eat this for a while now so tonight was the night! I didn't really change much except that I didn't pay any attention to the quantities and I did add some peas at the very end, right before forming the pie. Basically it's a simple beef stew with cheddar cheese incorporated into it and baked with puff pastry dough. 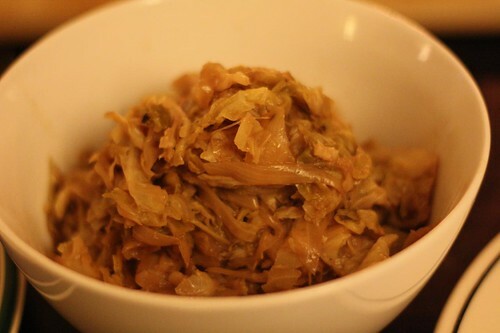 For a side dish I made beer-braised cabbage with Guinness. I stewed some garlic, onion, and cabbage with butter then added the cabbage, Guinness, mustard powder, Worchestershire sauce, and a little brown sugar, salt, and pepper. 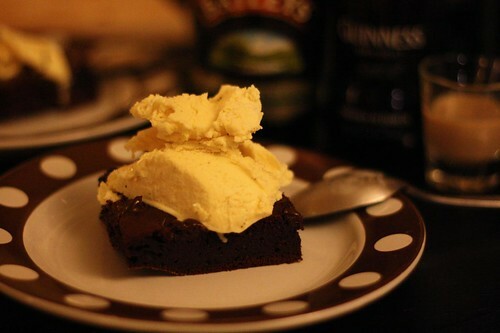 For dessert I used up another bottle of Guinness by making these Guinness chocolate brownies. I used a basic brownie recipe and added Guinness Extra Stout to it. While they were still warm I scooped up some vanilla ice cream to serve on top. But that wasn't the only dessert. After talking the other day I determined that I haven't had an Irish car bomb in over ten years. I also determined that that was a very good thing. I think even then I had done it out of duress. While I enjoy many different foods and beverages I've never been a fan of any beverage that forces you to chug. This is probably why I'm not a big fan of doing shots. The same thing makes me cringe at the idea of food-eating contests. Even thinking about one of those hot dog eating contests makes me feel like I'm going to gag. I don't even have to watch it. I just imagine that skinny Japanese guy and those bulky Americans sitting at that table in front of mounds of hot dogs and not only does it make me feel physically ill but it makes me think that maybe I'll never eat food again. My memory of my last (and first) Irish car bomb was that it was actually pretty tasty. 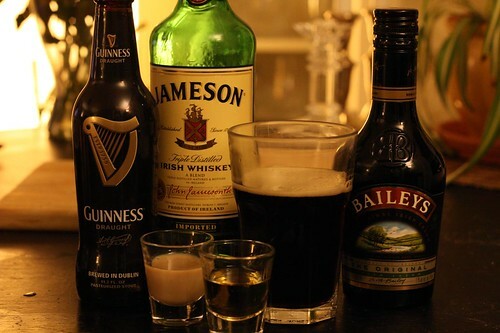 So it was that I determined I would make Irish car bombs but I would sip mine slowly. Seeing it is so sweet from the Bailey's Irish Cream it would make a nice after dinner drink to accompany the brownies. Jen reminded me that the Bailey's would curdle quickly (hence the reason this is meant to be guzzled in one gulp). That's why I elected to pour myself a tiny amount of Guinness, Bailey's, and Jameson which I would rotate through slowly over the course of forty-five minutes. Jen did hers the natural way and ended up with a curdled mess toward the end. Just watching her suffer through it reminded me of why I had no desire to do such a thing. The whole thing just looked like a chore. Except, unlike most chores, when you are finished you are seized with the urge to go: "Whooooooo!" Sorry you were in such pain yesterday. I can so relate to that. Also, I am 100% in agreement about eating contests. Even thinking about gagging down a bunch of hot dogs, pie, etc. makes me feel ill. It's truly disgusting. Glad to be back in fighting shape today!